The development site has had a history of use as a former quarry, mined for the gravels of the Alluvial Fan Deposits. 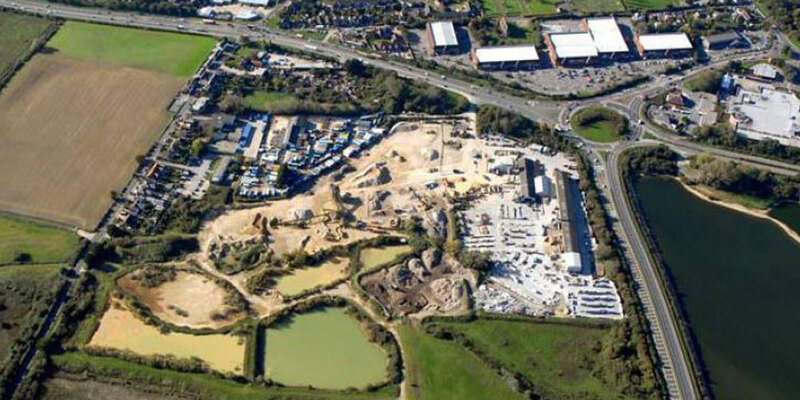 Prior to redevelopment the site included several silt tailing ponds and large spoil heaps, as well as a landfill reportedly infilled with the workings from the adjacent A-road. The enabling works were undertaken prior to purchase by the Client and comprised levelling the site and cement stabilisation of the formation level to provide a working platform for the development. LEAP’s intrusive investigations indicate the site is underlain by up to 10m of fill, comprising made ground over silt tailings with some organic deposits in the recently infilled lakes. The site is further complicated with a high groundwater table and surrounded by landfill sites with complex land gas issues. LEAP acted as Geotechnical and Geoenvironmental specialist for the housebuilder to provide ground engineering advice and support on this complex project from the enabling works through to project completion. Early involvement during the cement stabilisation works and phased intrusive investigation has enabled LEAP to build up a detailed picture of the ground conditions and provide value engineered solutions.